A shower scrubbing powder or ‘Showder’ as Lush calls it. It’s a dry shower scrub of calamine powder and sugar. This one has the Snowfairy scent. Here’s a video i made of Candy Floss Showder and what it looks like up close and how to use. 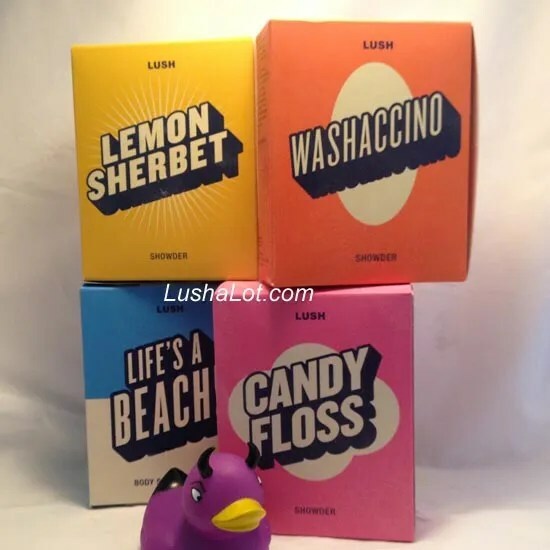 Posted on September 19, 2015 by Lushalot	• This entry was posted in Lush Oxford Street store exclusives, New, Scrubs Solid, new "Rhoulades',& new "Showders" and tagged 2015, calamine powder, candy floss showder, candy fluff, clove bud oil, demo, granulated sugar, New, oxford street, pink, review, scent family, showders, shower, snow fairy shower gel, vanilla, video. Bookmark the permalink.